Welcome to the fifth edition of TFiF (Thank Firebrand it's Friday). This week we look at cyber-warfare, the death of an internet giant and App creation for the web coding challenged. Let's get to it. Last week saw the quiet passing of an internet legend. 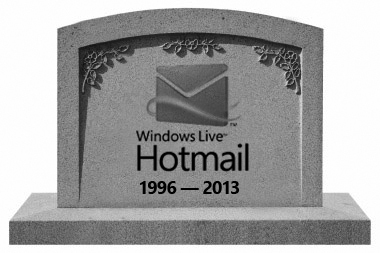 After 16 years of dedicated service, Hotmail was finally put out to pasture by Microsoft to be replaced by the metro styled Outlook. Final transition from Hotmail to Outlook saw the migration of more than 300 million live Email accounts, which equates to more than 150 petabytes of data (1 petabyte = 1000 terabytes). No doubt a majority of that data fell into 2 categories, social media notifications or Spam. "Sir I have won lottery, need bank account to transfer my many millions, will give you 5%".....seems legit, here's my bank details and 4 digit pin code. In recent years we have seen the rise of cyber crime and the increasing insurmountable danger in a world seemingly dominated by computers. Only last week Hackers compromised Twitter accounts from the Associated Press, causing Stock Markets to tank for following a false tweet claiming an attack on the White House. Industrial Control Systems could be hacked disrupting dams, oil refineries and the national grid. Think of the riots following the New York blackout, or when that dam collapsed and Superman had to race to save the town from the onrushing flood (ok the second happened in a movie, but you see my point). Satellite based navigation systems could be manipulated affecting GPS data, planes provided with incorrect locational data, or you end up in a field instead of Tesco car park! For those that have seen Fight Club a similar scenario could play out where London, Tokyo and New York Stock exchange data could be wiped out. Did anyone say sextuple dip recession? Enough of the doom and gloom, ever wanted to tap into the App market but lack the programming skills? In steps the Zipapp web site, this free resource allows you to create your own app without ever having to write or learn a single line of code. The web based platform allows you to create a variety of static pages within the application, using feeds from Twitter/YouTube/Facebook and any compatible RSS feed. So if you want to create a Windows 8 version of your Wordpress / Google blog and have an active Facebook, Twitter and YouTube channels, in quick time, Zippapp can help you achieve this. Check out this 8 minute video, it really is simple. So there we have it, another week of Thank Firebrand it's Friday in the bag. Join us next week for more news, reviews and hopefully whacky goings on.